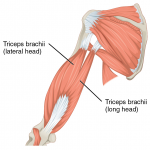 Prioritise the biggest muscles first: the triceps, followed by biceps and brachialis. 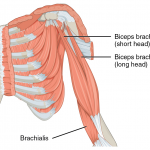 Use a close grip bench press with either resistance bands or chains to work the triceps harder. Make sure you have a spotter on your first attempt. You don’t want to go too fast too soon & get into trouble. Follow this by using a weighted dip to target the lateral and medial heads of the triceps. If you can’t manage dips, try practicing the eccentric movement to gradually build up strength. Now it’s time to work the biceps. Go heavy – they respond better to heavy loads with low reps e.g. use a weighted chin up. If you can’t manage a full chin up quite yet then practice using a resistance band looped over the bar and under your knees. Follow this by using two types of bicep curls – the standing curl to emphasise the long head and the seated incline curl with forearm supination for the short head. Finish the arm workout by using an EZ bar to perform reverse curls. Stand using a bent forward posture (from the hips, not back) or by adding band resistance.